The next time we return to the Marvel Cinematic Universe, it'll be to explore the origin story of Carol Danvers aka Captain Marvel. Portrayed by newcomer Brie Larson, Captain Marvel has had very little presence in the MCU outside of the post-credits scene in Avengers: Infinity War. However, she's expected to be a huge part of the MCU going forward. According to Variety, Captain Marvel has officially surpassed $1 billion at the worldwide box office. The milestone means Marvel's newest hero has joined the like the other Marvel films such as Black Panther, Avengers: Infinity War, and Captain America: Civil War. The movie marks the first film in Marvel's large library that focuses entirely on a female superhero, following in the footsteps of DC's Wonder Woman—a movie that fell short of the $1 billion mark but still garnered an incredible $841 million globally. Fans will next see Captain Marvel star in Avengers: Endgame. Higher, faster, further, it all went according to plan for Captain Marvel. The latest Marvel movie opened this past weekend and it blasted off in record-breaking fashion with a beastly $153 million opening weekend at the domestic box office. The $153 million opening mark is the biggest opening ever for a female-led superhero movie, easily surpassing Wonder Woman's $103 million opening in 2017. The good news didn't end there. Captain Marvel also took in $302 million internationally, which puts its worldwide box office take at $455 million—the sixth largest opening of all time. This continues to the impressive run of success for the MCU with yet another movie on its way to grossing over $1 billion at the box office. This all but assures a Captain Marvel sequel is happening. Ahead of the release of Captain Marvel, many people wondered how it would connect to Avengers: Endgame. Now we know. Keeping with tradition, Stan Lee has a wonderful cameo appearance in Captain Marvel. Captain Marvel has finally been released in theaters, and it is an important milestone for a few reasons. It's the first female-led superhero movie in the Marvel universe, with Brie Larson starring as the titular hero. It's also the first posthumous cameo from legendary artist Stan Lee, who passed away last year at the age of 95. Marvel is keeping with its tradition of including at least one post-credit scene in its latest movie, Captain Marvel. The first Marvel movie to star a female protagonist will include two post-credit scenes. This shouldn't come as a surprise. Marvel loves dropping post-credit scenes to service as the exclamation point to the movie and set-up the movie's connection to the overall Marvel Cinematic Universe. The early reaction to the post-credit scenes doesn't spoil the scenes, and even if it did, we wouldn't spoil them for you because that's just rude. What the reaction does reveal is that one of the scenes will definitely get us excited for Avengers: Endgame. There's just something about seeing a 90's website in action that lets us know how far we've come over the past two decades. Seeing as Captain Marvel is set in the 90's, it just made too much sense not to create a 90's site for it and Marvel did not disappoint. 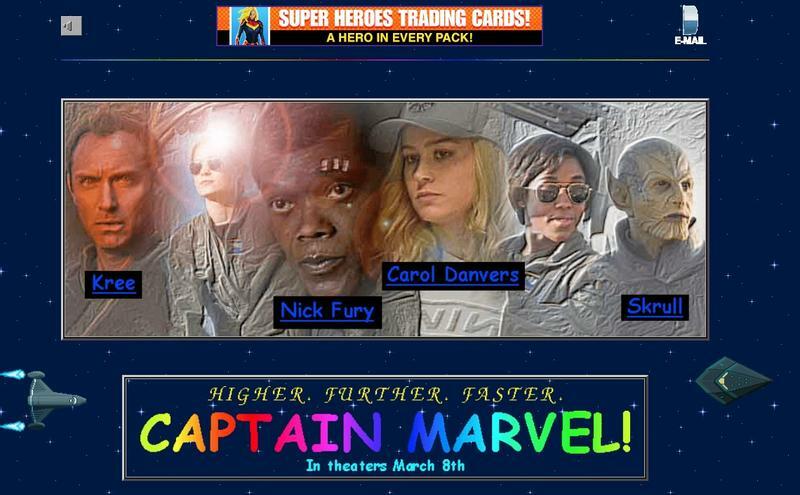 Much like the iconic site for Space Jam that is still up, Captain Marvel's site has plenty of boxy designs, rainbow text and endless looping gifs that transport us back to simpler times. It works just like regular sites but you'll get a real kick out of site, especially with the Skrull dressed as an elderly lady popping in and out as you scroll (pun intended) down the site. It's quite endearing. "Oh boy, you guys don't have any clue," relates Captain Marvel as she explains to Fury the danger that Earth is in with Skrulls. There's also a really amusing scene in which a Skrull, in a combination of a scream and growl, tries to intimidate Captain Marvel for which she returns the favor and screams at the green monster. Our review for Captain Marvel is in, and it talks about what we liked and disliked about Marvel's newest movie. Although it's not a perfect movie, it provides plenty of important backstory for Carol Danvers (a.k.a. Captain Marvel) and how she becomes one of the strongest superheroes in the universe. Captain Marvel is going to play a major part in the MCU going forward, and we can say that her solo movie is a great start. We've seen Brie Larson don the different suits and wield powerful abilities as Captain Marvel, but who exactly is this new cosmic character? She is Carol Danvers, an ex-U.S. Air Force fighter pilot who becomes a member of the elite Kree military unit known as Starforce. She experiences an aerial accident and is rescued by the Kree, where she's given her newfound powerful abilities. She is then recruited by Starforce, where she is trained by Yon-Rogg, played by actor Jude Law. Interestingly, the accident erases her human memories though they come back to her from time to time and will play a big role when she returns back to Earth. Set to the backdrop of the Kree-Skrull War, Captain Marvel makes her way to Earth to hunt down the infiltrating Skrull, which is where she will come across a much younger Nick Fury as a low-level S.H.I.E.L.D. company man who is quite interested in her abilities. The Kree-Skrull War could help explain where she has been all this time. Since she's been busy stopping an intergalactic battle from affecting other galaxies, she may have missed some of the events taking place on Earth. Captain Marvel is turning back the time and will be the first MCU movie that takes place in the 1990s. The trailers made that pretty clear with the Blockbuster Video and Nick Fury's full head of hair. With the open slate, the movie has a lot of room to do whatever it wants as it is not directly tied down by closely related MCU movies. It is set in a world before the Avengers. In fact, the only hero the world has seen at this point is Captain America. Captain America: The First Avenger introduced us to the origin story of the MCU and Captain Marvel is going to set the stage for the Avengers. As such, it's pretty clear Captain Marvel will be an unofficial prequel to the Avengers movies. It will be before S.H.I.E.L.D. is the entity behind the Avengers and that will be directly due to Nick Fury coming across Captain Marvel, the first superhero he meets. "Truth be told, I was ready to hang it up until I met you today," says Fury in one of Captain Marvel's trailers. We're not too familiar with the origin story of Nick Fury, but what the movie is making clear is that he will create the Avengers Initiative when he meets Captain Marvel and is convinced there are other special beings out there in the world. Some are good while others are not. Speaking of bad guys, the Skrulls are going to be primary antagonist in the movie. They are an extraterrestrial race who were first introduced in 1962 in the Fantastic Four #2 issue. Donning auspicious green skin with sharp ears, they look nothing like humans, but they do have the ability to shapeshift. That gives them the ability to easily infiltrate planets, which is what they're doing in Captain Marvel. Their origin dates back to the planet Skrullos where cosmic engineers known as the Celestial experiment on them resulting in the race splitting into three factions: Normals, Deviants and Eternals. As their names suggests, the Normals are quite normal, the Eternals gain eternal life and the Deviants gain the shapeshifting ability. The Normals take up control for a long time until the Deviants overtake them and wipe out the other two factions. Eventually their nefarious plans take them to Earth where they take on Captain Marvel. The main leader of the Skrull will be Talos, who will be the primary antagonist battling Captain Marvel throughout the movie. He has not only infiltrated Earth, he has also taken up a spot at S.H.I.E.L.D. working as Nick Fury's boss. One of the most interesting aspects of Captain Marvel is that it'll lead right into Avengers: Endgame. That's because at some point in the movie, Captain Marvel will hand Nick Fury a pager and let him know he can ping her anytime Earth is in trouble. That trouble hotline comes in handy when a big purple alien arrives in Wakanda and snaps his finger, erasing half the known universe. Captain Marvel is set to play a big role in Endgame where she'll undoubtedly trade blows with Thanos. When can I watch Captain Marvel? Captain Marvel will fly into theaters on March 8. Its run time should come in at two hours and ten minutes, which is on a par for most MCU movies.